Barb was born in Bellingham on October 15, 1946 to parents Herman and Priscilla (Noteboom) Vander Griend. Barb and Leroy “Lee” Kamps were married in June of 1967. Together they were self-employed at Lee’s Appliance Repair. She was the gal in the office and the one whom everyone talked to. Barb graduated from Cosmetology School and did many ladies hair in Lynden. She enjoyed crocheting, road trips, time with the kids and grandkids, fanci work, and painting. Barb loved chickens and collected many chicken items. Barb is preceded in death by her parents Herman and Priscilla Vander Griend, brother Dennis Vander Griend, grandsons Andrew Kamps and Benjamin Kamps, and great grandson Noah Carter. She was an amazing wife, mother and grandmother and will be greatly missed by husband Leroy; children Darrin (Maria) Kamps, Jeff (Jill) Kamps, Brad (Anne) Kamps and Stefanie (Anthony) Medawar; grandchildren Emilee (Cody) Stacy, Tyler Kamps, Lauren (Jordan) Carter, Jacob (Aly) Kamps, Ashley Kamps, James Thomas, and Kaitlyn Lucerne; and great grandchild Quinn Carter. You are invited to join family and friends for Barb’s memorial service at 2 p.m. on Saturday, March 16th at Faith Community Church, 586 Birch Bay Lynden Rd, Lynden. In lieu of flowers, memorials may be sent to Ebenezer Christian School, 9390 Guide Meridian Rd, Lynden, WA 98264. Arrangements are entrusted to Gillies Funeral Home and Cremation Services. To send flowers or a remembrance gift to the family of Barbara L. Kamps, please visit our Tribute Store. 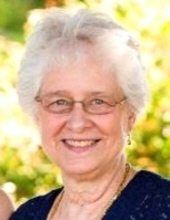 "Email Address" would like to share the life celebration of Barbara L. Kamps. Click on the "link" to go to share a favorite memory or leave a condolence message for the family.